To install automatic feed wood chip central heating to provide warmth and hot water for a new retail store built on a brownfield site in the south of the UK. A leading home furnishing retailer with ambitions to double its number of stores in the next 5 years. One of 14 UK stores serving the South East of England and South East Midlands as it is less than 1 hour’s drive from north London. They work with sustainable building practices and operations and offer a number of products with recycled and sustainable content. This company also try to recycle or re-use as much of their trade waste as possible. Current recycling levels are at a company-wide average level of 75% with an international aspiration for the stores to recycle 90% of their own in-store-generated waste. This includes plastic, metal and cardboard recycling, rainwater collection for the ‘grey water’ systems and fire sprinkler tanks. For the Milton Keynes store they sought to further enhance their environmental performance, save carbon and reduce dependence on fossil fuels by installing a biomass boiler to be the primary heating plant for the store and a wood waste boiler to burn a proportion of their clean pallets and packaging. The store, built on a brownfield site to the south of Milton Keynes City, required installation of a biomass boiler as well as a regular maintenance plan. 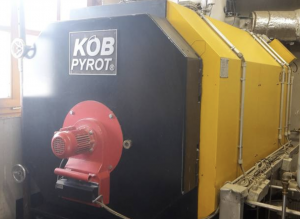 A Köb PYRTEC 950 kW biomass boiler was selected for the main heating boiler. This is fitted with automatic ignition, cleaning and de-ashing equipment and is capable of burning woodchip fuel of up to 50% moisture content. A 120 cubic metre fuel store with walking floor extraction is located under the loading deck where HGVs turn to unload their cargo of furniture. When not in use, the fuel store leading-hatch covers form part of the HGVs turn to unload their cargo of furniture. When not in use, the fuel store loading-hatch covers form part of the HGV turning area and do not inhibit any of the retail operation. About once a week a ‘walking floor’ lorry delivers 100 cubic metres of woodhip fuel into the fuel store. The fuel is delivered from the store to the boiler by a series of augers. The boiler modulates its output to match the heat load of the building. The boiler uses a pneumatic self-cleaning system and automatic de-ashing to an 800 litre wheeled bin so routine maintenance is minimised. The boiler is shut down for manual cleaning once a month which takes about an hour to complete. A Köb PYROT 220 kW wood waste boiler has been installed along with a shredder, magnetic separator conveyors and a silo as a complete package to recycle clean wood waste from pallets into useful heat for the store. The boiler is capable of burning just under 45kg per hour of clean wood waste. The silo is capable of storing over 50 cubic metres of wood so that the shredder may be run from time to time with a secure stock of wood fuel available to heat the store 24 hours a day. The A Köb PYROT 220 boiler has been supplied complete with flue-gas recirculation to minimise emissions, automatic ignition, cleaning and the-ashing, in common with most other boilers in the Köb range. A flue cyclone has also been fitted to ensure minimum particulate emission from the potentially dusty fuel. A Köb PYROT 220 kW boiler operates as the lead boiler and supplies heat to the store 24 hours a day subject to fuel availability. It burns up to 7.5 tonnes of fuel per week producing around 24MWh of heat. Because of its high duty rating the boiler needs to be shut down for cleaning once a week – this results in about 3 hours of down time although the cleaning procedure takes only half an hour. The PYROT boiler will contribute a carbon saving of around 350 tonnes per year. This leading retailer is one of the first multinational companies in the UK to install a biomass boiler on purely commercial terms. The specification and design of the Köb hearing plant means that they will benefit from a secure, locally-sourced fuel at a competitive price together with predicted carbon savings of over 1500 tonnes per year. Get in touch to discuss your requirements. With over 30 years of biomass specialist experience, our knowledgeable team will be happy to help.